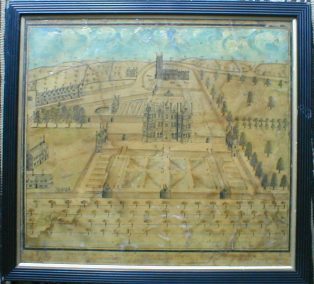 Painting of Campden House showing how it might have looked. From 2016 to 2018, with the permission of The Landmark Trust, Scheduled Monument Consent and a grant from the Heritage Lottery Fund CCHS carried out a major investigation of the site of Sir Baptist Hicks’ ‘Great House’. The impetus for the research was Gloucestershire Local History Association’s Local History Day in October 2013 when CCHS won the ‘Best Display’. The subsequent expanded exhibition in the Town Hall in June 2014 attracted nearly 600 people. The challenge is that the house existed for a very short period from c.1612 to 1645, and there is little reliable evidence of what it really looked like and virtually nothing left of the house and its spectacular gardens. Tantalising clues remain in the form of the Banqueting Houses, the distinctive gatehouse with its rare ‘pepperpot’ lodges and the lumps and bumps that are the vestiges of the once fine gardens. However, of the house itself only a small fragment of ruined wall remains. There are several images of the house, thought to be taken from a 17th century drawing, but their accuracy cannot be wholly relied on. We turned detective to recreate how this magnificent house would have looked, its extensive formal gardens, the lavish interiors and its impact on the town of Chipping Campden. By a combination of archival research, local knowledge and practical investigation of the site itself, including a geophysical survey and archaeological digs, we hope to resurrect the ‘great burnt howse’* which has been lost for 400 years. 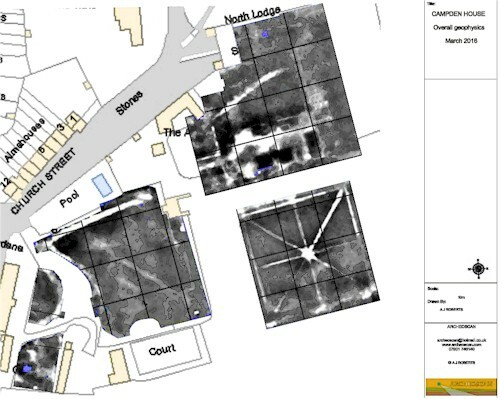 The geophysical survey clearly shows the outlines of the house and gardens. This encouraged us to get Scheduled Monument permission and the funding to do some real exploration, including soil sampling. Twenty four display boards cover the results of our research up to 2014 including sections on Sir Baptist Hicks, the Civil War and ending with ‘What Happened Next’ to bring the story up to date, but the heart of the display covers the superb house and its magnificent garden. Among the sources used were books, articles and papers, a variety of documents of many ages, photographs of various dates from Victorian to modern including aerial ones and information provided by the Landmark Trust. Members of CCHS have assisted in clearing part of the garden area and also carried out (with permission) a geophysical survey of the garden and house site. In 2016 we were awarded a two-year grant of £26,300 from the Heritage Lottery Fund to undertake excavations on the site and do further research to try to find out more about the original design of the garden and evidence of the layout and internal decoration of the house. The team of volunteers have now (May 2018) uncovered a huge amount of information about Baptist Hicks, Jacobean gardens and building, decoration and design. This will be distilled into a book to be published later this year, and information not used in the book will be added to an archive on this website. Local schoolchildren have toured the site on several occasions and were invited to paint, draw, build – imagine – what they think the house and gardens looked like. 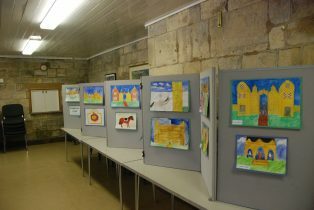 Their efforts were displayed in the Lower Room at the Town Hall during the 2014 exhibition. In 2017, two of our volunteers visited local schools to run classes on Elizabethan food and, in particular, the sweetmeats that would have been served in the Banqueting Houses. 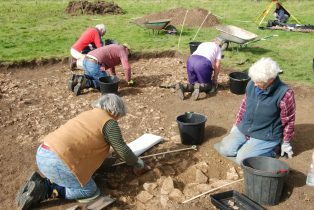 Information about the progress of the project, including what we uncovered on the digs, can be found on our Project Blog. We are grateful to The Landmark Trust for permission to work on the site, to the Heritage Lottery Fund and other donors for funding and to Historic England for Scheduled Monument consent.